Since it's kinda late and it is baseball season and I really can't think of a single thing at the moment I thought I would repost something I did in 2008. And I have to say I'm still out, ate an entire package on Saturday and we have a game tonight. Guess I will be stopping at Academy. The boys and I buy seeds before every game . R1 likes the plain old regular flavor. R2 calls them flower seeds and he like BBQ the best. Me, well they came out with a new flavor this year. Are you ready? Dill Pickle. Oh yeah! 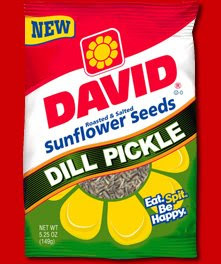 I love me some Dill Pickle sunflower seeds. As a matter of fact I have some in my mouth right now. Yes I would consider myself an experienced seed eater. I do just like they say one would do. I pop a handful, well not a handful about 10-12 in my mouth. Store them in one cheek and transfer one over to the other side. I crack the shell and eat the seed. But I don't spit the shell. So unlady like. (yeah like having a cheek full of sunflower seeds is lady like) I take the shell out with my fingers and throw it on the ground or in the trash can. Along with several other moms I can eat a whole bag by myself. It must be a sight to see all of us moms sitting by the dugout in our chairs with our cheeks puffed out with seeds and "spitting". So with that. Eat. Spit. Be happy. i love sunflower seeds for a hike, but i'm no where near brave enough to try dill pickle flavored ones! I really need to try the dill pickle flavored ones! I know it's unladylike, but I DO spit mine ~ though in a cup, not on the ground!